Eldercare Services cares about your feedback. 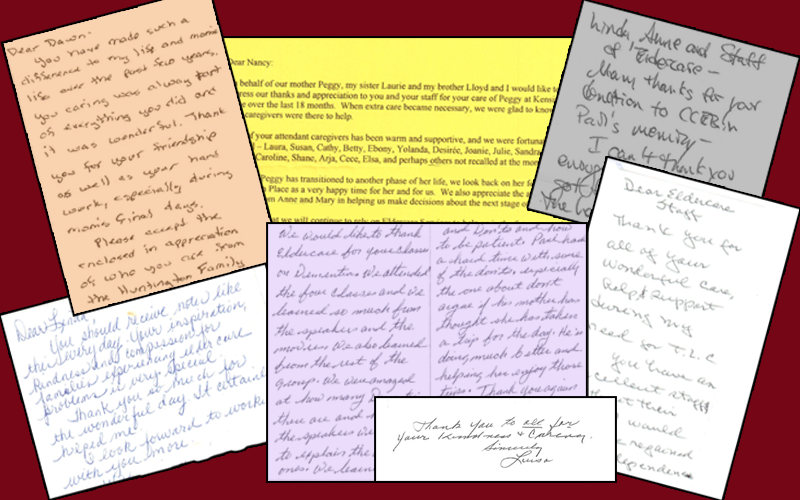 Below are some of our most recent Eldercare reviews by those who have experienced our services. Thank you so much for creating the ‘Do’s and Don’t page’ for communication with a person who has a dementia. It is wonderful and helped me today with my dad. I talked with him on the phone and just kept looking at the page, to be sure I stayed ‘on script’. We were able to talk for 30 minutes, which was delightful. At the bottom of the page, you share the tip that one of the goals is to convey to the person that you understand what he/she is feeling. I did this by tuning into the emotions he is experiencing, within the delusion, rather than join him in reshaping the NBA All-star game (he was assigned the task…). I said, “Wow, that sounds scary and also important.” and by staying with what is true, his feelings, we stayed more connected. I don’t know if this is of any help to share; I just felt like sending it on the tiny chance, since your email address was right there on the page. Eldercare has been helping take care of my elderly mom for almost a year now. Their service and employees are wonderful. For about the first six months while my mom was living alone, in Rossmoor, a caregiver would come to her apartment 2 twice a week. The caregivers, particularly Silvia were extremely kind and helpful. Silvia and my mom always looked forward to their visits and they became friends. Silvia was always helpful getting my mom to the grocery store, taking her shopping etc. In April, because of her deteriorating mental and physical health, my mom moved into a managed care facility in Moraga. Silvia has continued to see her twice a week and my mom enjoys her visits. Sylvia is able to take on outings to coffee shops, etc, that my mom would probably not otherwise enjoy. Silvia is always very warm and reliable and helpful. After my mom’s move to the managed care facility, I’ve also been having one of their Care Managers, Katie, help me with managing all my mom’s medical appointments, pharmacy refills, etc. and in general lining up all her outside medical care. This additional service is rather pricey, but you get what you pay for. Katie has been outstanding in her professionalism, knowledge, and attention to detail and communication. I don’t know how I would have managed to keep track of all my mom’s medical as well as financial affairs without her. I’m the only family my mom has in the Bay Area, and don’t have any help besides Eldercare in managing her outside affairs. I found Eldercare through a recommendation from one of my own doctors who utilized their Case Management service (although it was someone besides Katie) and was equally pleased. I wouldn’t hesitate to recommend them. Their caregiver hourly rates are less than $30 which seems quite in line with other companies (we tried one other but they weren’t nearly as good). The Case Worker service is more of a consultant role who and not hands on patient care, with rates to match (well over $100/hour) but as I said, you get what you pay for. I wouldn’t hesitate to recommend them to anyone faced with a similar situation of having to care for an elderly relative and not having much additional family to help out. Outstanding Results! As a Financial Planner I get involved with my clients far beyond investments and planning. It is very important for me to have a strong network of professionals outside of my skill set. I have a client that has sole responsibility for caring for his adult disabled sister. Her cancer had just returned and at the same time he was told she could no longer stay at her current care facility as her mental care needs have now exceeded their limits. I had been following her circumstances and frequently called (call him Bob) my client to see how she was doing. One day Bob, who is in his 60’salled me and was very distraught. He didn’t know where to turn. His sister’s care needs had reached his capacity. He needed to arrange her surgery, post surgery care and arrange transportation for her follow up radiation. At the same time her care facility was demanding she move. I insisted he call Lori Luckenbach at Eldercare Services. I told Bob to follow her instructions and meet with the people she lines up. A week later, a totally different, and tearful call from Bob: Kirk, they can do everything. All the things I’ve worried about for years, they can handle for me. Beyond that there is extra security around Bob’s biggest fear. If he were to pass before his sister there will be a team that knows his sister and can continue oversight in his absence. Keep up the great work. I will continue to recommend your services. Its never easy to make that decision to hire a care giver. Luckily for me and my family we found Eldercare Services. They put all of our concerns at ease and their staff is extremely friendly and professional. With our busy schedule it’s difficult to give grandma the help and attention she needs. Thankfully that isn’t an issue any longer. The communication has been great since we signed up back in June and I would highly recommend them to anybody who is looking for similar services. We have used Eldercare Services Care Mgt Services for over a year now and are extremely satisfied. We work with Chris Rose-Franks, an extremely competent and insightful care manager, and have found the other care managers who have filled in for Chris when she’s on vacation to be of high quality as well. We are a family where it has not been easy coordinating care for our father with advanced Parkinsons, with two of the four family members distant or out of state with the resulting difficult family dynamics. Beside managing our father’s immediate needs Chris is extremely sensitive to the family dynamics, and has handled those dynamics deftly. These professional services are not cheap, but I can’t say how much time and angst Chris has saved us from. That has been well worth the price. I’m not sure where these few negative reviews come from. There have been no surprises on our bills and Chris has kept a sharp pencil on our behalf. Eldercare Services has exceeded our expectations and I recommend them without reservation. For more Eldercare reviews, visit our yelp.com profile.